Can you feel the excitement in the air? Well, I can! It’s time, once again, to dig out the hats and blow the dust out of the julep cups! Today marks the 142nd annual running of The Kentucky Derby, the first, and most venerable, jewel in thoroughbred horse racing’s Triple Crown. I look forward to this race, as well as the other two jewels, The Preakness and The Belmont, as if I were born under a blanket of red roses, clutching a racing form in my tiny fist. Those of you who are long-time readers of this blog know that I was not. I’m a city girl, born and bred and my exposure to actual real live horses has been limited, at best. One of my best friends in high school knew horses, had horses and and rode well. She got me on one, once. It did not go well. No, my fascination with all things equine began about nine years ago. I told you Google was one of my favorite toys. I get Google Alerts for Thoroughbred Racing and am a regular reader of blogs and publications like Thoroughbred Daily News (“The world’s leading daily bloodstock publication”). But research aside, I remember the conversation that started it all, with one of my co-writers, K. R. Brorman. Now, she has actual experience and wisdom, if not with thoroughbreds then horses in general and with “the business”. Thankfully she shared it with me. I used her know-how then and will continue to do so, including her near encyclopedic knowledge of how to “kill things and make it look like natural causes”#. We spent long hours discussing the best way for nefarious goons to ensure a horse would be unfit to run, but that wouldn’t actually “hurt” the animal. I, at least, am a softie. Our lead characters, mine, as well as those belonging to K.R. Brorman and C.C. Cedras, which have changed to one extent or another since we started writing together, still bet the fillies. Strong females after all have to stick together. Just as we mourned the loss of Eight Belles*, we rooted for Rachel Alexandra**. Yesterday, I cheered as Rachel’s daughter, Rachel’s Valentina, started the Oaks (the pre-Derby race for fillies only) heavily favorited at 7-2. Unfortunately she lost to Cathryn Sophia (what a grand name for a horse!). 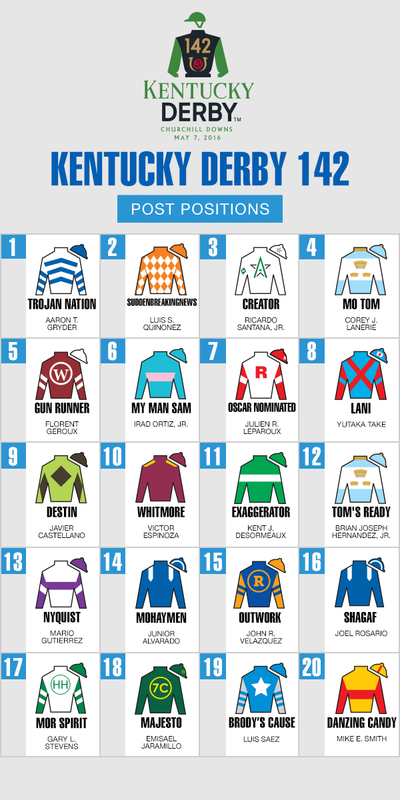 Speaking of grand names, I still make my picks, and the occasional wager – I made my first in 2014, just weeks after the Boston Marathon bombings, on a horse called Wicked Strong – based on the name. At least I’m not alone. This year, I’m thinking seriously of putting money on My Man Sam (Do I really need to explain that? ***), though he’s at 20-1. As I’ve said before, I’ve fallen in love with the “Sport of Kings” and the athletes (both horse and rider) who compete. I get a kick out the fact that I recognize names of trainers, owners and jockeys. I’m sad that this year there will be no feisty Cajun rider called Calvin Borel, but then again, he may decide, as Gary Stevens did, that retirement is not for him. I’m a sucker for a Cinderella story, such as 2014 Kentucky Derby Winner California Chrome, who cost his connections (that’s how a horse’s owners and trainers are referred to in the game) a paltry $10,000 and has since earned more than $12.5 million. Though my sister and nieces live just outside of Louisville, KY, I’ve never been to a Derby. It’s on my bucket list, but it will have to wait until I’m no longer employed by a University whose students insist on graduating in the spring. I’m in luck though, since Steve Wynn lost his bid to build a ginormous casino in Massachusetts, Suffolk Downs here in Boston will have three 2-day meets this year. I’m hoping for some eyes, if not hands, on research! I’ll definitely need a new hat. How about you? Ever been to a race? If you’re a writer, to what lengths do you go to research a subject? Have you discovered a new hobby or hidden talent in the pursuit? *2008, Eight Belles came in 2nd in the Kentucky Derby and then broke both of her front legs in front of a crowd of more than 150,000 and had to be euthanized. *** Sam Heughan. Outlander. C’mon! My hat may be a sweaty, somewhat frayed gardening hat, but the mint will be yanked right out of the garden and muddled for the Makers Mark in time for 6:34 this evening. Great post! Races? Yep! Even walked the hallowed grounds in Kentucky. I know more about art, shoes, human trafficking and the affects of IEDs on the human body than I ever imagined all in the name of research. Horse racing and the Kentucky Derby in particular will always turn my thoughts to you dear Sheri. No matter who gave the inspiration or in what manner the research and information is obtained, YOU brought it to life for me. That made me verklempt. Thank you Dawn! Leave a reply on "Derby Day Redux"